You’ve probably seen it in countless movies. 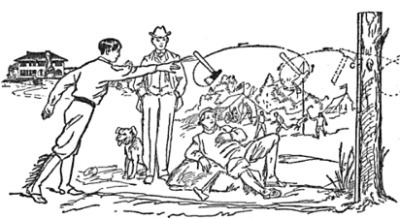 A mountain man or Native American takes a man down by hurling a tomahawk through the air and sticking it into his enemy’s back. If you’re going to strike a man down, I can’t think of a more badass way to do it than with a tomahawk. But contrary to popular belief, Native Americans and mountain men rarely threw their tomahawks, or ‘hawks, during battle. A tomahawk was one of their best hand-to-hand weapons, good for both offensive and defensive moves. Throwing a tomahawk to kill an enemy, while certainly very cool looking, put considerable distance between the thrower and his very best weapon. Even if a mountain man or Indian warrior killed his target, he was pretty much defenseless while he scurried to retrieve his hawk from his victim’s body. Instead of throwing their tomahawks in the heat of battle, mountain men and Indians hurled their hawks mainly for fun. A few times a year, mountain men would come into town to gather supplies and trade pelts they had collected during the previous hunting season. They’d often set up a huge camp outside the town and take part in various contests such as tomahawk throwing. Some Native American tribes held similar contests of skill for their men to take part in. Indians would also come to the frontiersmen’s camps to engage in trading and throw some tomahawks with the buckskin-clad white man. 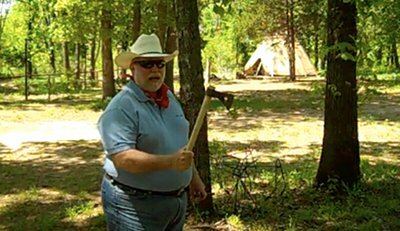 Like the mountain men of old, you too can take up tomahawk throwing to pass the time on a warm summer’s day. It’s a great activity to do with kids because it’s so stinkin’ easy. 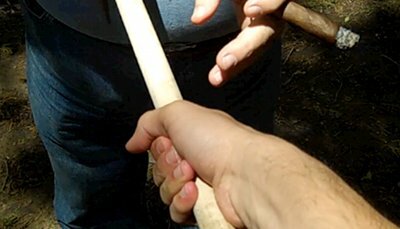 Today we’ll talk about how to throw a tomahawk, but we’ll begin with a little history on this unique weapon and tool, for those who are curious. Tomahawks originated in North America amongst the Iroquoian and Algonquian Indians who used them as tools, weapons, and ceremonial pieces. The word comes from a transliteration of the Algonquin word for “to strike down.” The first tomahawks were made with wooden shafts and heads of bone, rock, or wood. Europeans introduced the metal blade and traded the tomahawks with the Indians, who became very adept at using them in battle and came to greatly prize them. The poll of the tomahawk’s head — the side opposite the blade — consisted of a hammer, spike, or even a pipe. These pipe tomahawks, which were made with a bowl on the poll and a hollowed out shaft, were created by European and American artisans for trade and as diplomatic gifts for the Indian tribes; they symbolized two sides of a coin: war and peace. 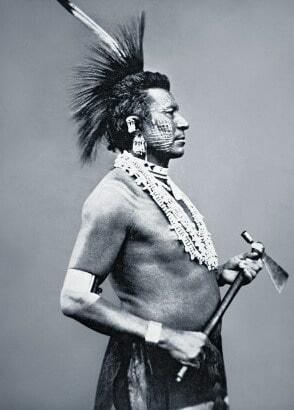 As multi-purpose tools, pipe tomahawks were considered extremely useful and desirable by the Indians. The tomahawk was carried by American soldiers during the Revolutionary War (in fact, the Continental Congress required militiamen to carry either a tomahawk or a cutting sword), to chop wood, dress game, and yes, even to hew down a redcoat, ala Mel Gibson in The Patriot. Flintlock guns were unreliable and slow to reload, and the tomahawk made an excellent back-up weapon for hand-to-hand combat. 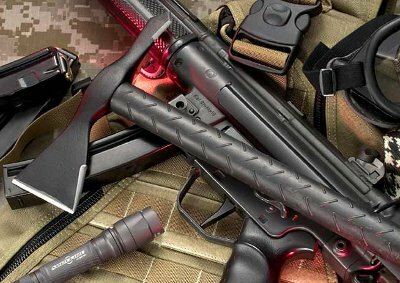 As guns advanced, the tomahawk fell into disuse, although it was still carried by some American soldiers during WWII and the Korean War. The tomahawk then enjoyed a bit of a revival during Vietnam. Between 1966 and 1970, Peter LaGana, a WWII veteran of Mohawk-descent, crafted and sold thousands of tactical tomahawks by direct mail to American troops serving in Vietnam. His updated tomahawk featured a sturdy, penetrating spike for the poll. Today, surprisingly enough, the tomahawk continues to be carried by some military units in Iraq and Afghanistan. 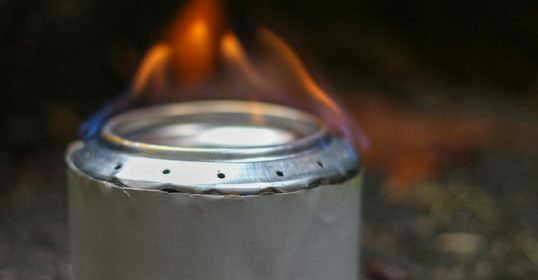 Although it can still be used for hand-to-hand combat (the Vietnam models are capable of penetrating a Kevlar helmet), the soldiers mostly use it as a handy multi-purpose tool capable of breaching doors, deflating tires, smashing windows, breaking locks, chopping through cinder blocks, and opening crates. And of course, it’s something that can be thrown for sport and amusement to pass the time. 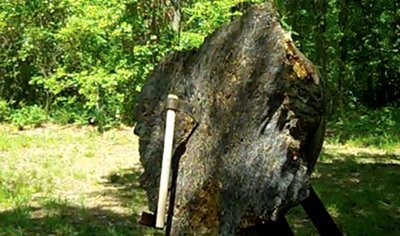 A note on nomenclature: While the differences between a hatchet and tomahawk are debated, they’re essentially the same thing. 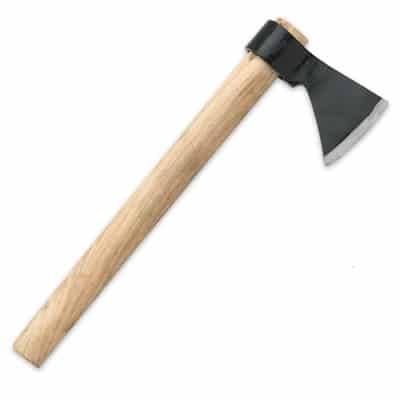 In colonial times, tomahawks referred to hatchets used primarily for war. Tomahawk. 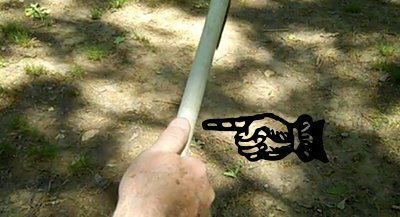 You can try to perfect your throwing skills with a small hatchet you have lying around, but I recommend buying a set specially made for throwing. They’re weighted to make throwing easier, so the learning curve isn’t as steep as you’d have with a regular ol’ hatchet. You can fork over quite a bit of money for nice, hand-forged throwing ‘hawks, but to get started I would go with something cheaper. Target. You need something that your ‘hawk will stick in when you throw it. 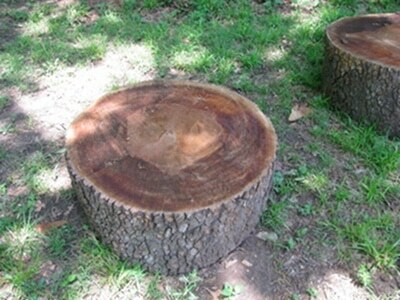 Tom recommends getting a large circular tree stump and cutting a slice at least 4 inches thick. After you cut your round, you need to season it so your tomahawk sticks nice and good. To season your target, just lay one side of the stump face down on the ground. Leave it there for a few months. 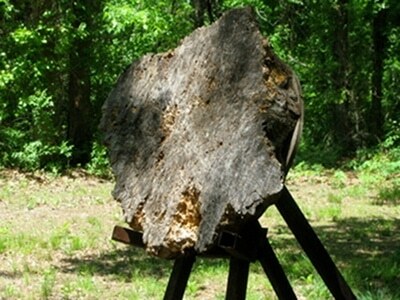 When the target is seasoned, mount it on a tripod stand made of tree limbs or metal. Target getting seasoned for future use. Rule #1: Don’t throw a tomahawk if there’s someone standing in front, behind, or beside your target. Rule #2: Keep the blade dull. You don’t need a razor sharp edge to make your tomahawk stick in the target. So, as an added safety measure to you and those around you, keep the blade dull enough that it won’t easily cut through skin. Make sure the head of the hawk isn’t rotated either left or right. You want it perfectly straight so that it flies through the air without wobbling side to side. Moving your thumb on top of the handle slows down the spin. This moves the axis point at which the tomahawk begins to spin up on the handle, causing it to spin later, thus slowing the total spin down. 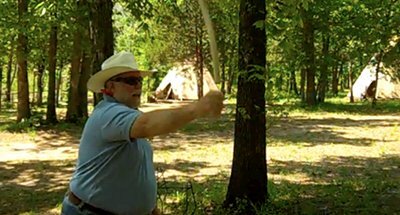 Throwing a tomahawk and making it stick in your target is easy. I was able to make the ‘hawk stick successfully on my very first throw. It’s pretty much like throwing a baseball. The key to successfully throwing a tomahawk is the distance between you and the target. Measure off about five normal steps from the target. That will give your tomahawk enough time to rotate twice so the head will stick in your target. Mark your spot once you’ve paced it off. Look at where you want the tomahawk to hit on your target. 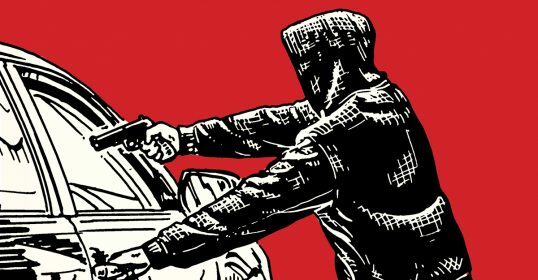 When you’re keyed in on your spot, swing your throwing arm down by your side. When the head of the axe passes your leg, swing your arm back up. When the axe blade passes your head, bring your arm forward again, like you were throwing a baseball. Simply release your grip on the handle when your arm is straight. The hawk will go spinning out of your hand. Let your arm continue in its downward trajectory. This ensures proper follow-through. Watch your ‘hawk stick into your target. That’s it. Easy right? Throwing a tomahawk is really quite satisfying and a great manly way to settle your mind. 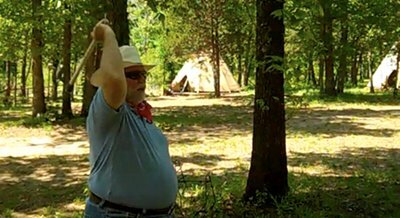 Once you get the hang of tomahawk-throwing basics, you can start getting fancy with your throws. Work on precision or try two-handed throws. Special thanks to Tom for taking the time to show me how to throw a tomahawk. If you’re ever in Oklahoma, I definitely recommend planning a weekend at Meadowlake Ranch. 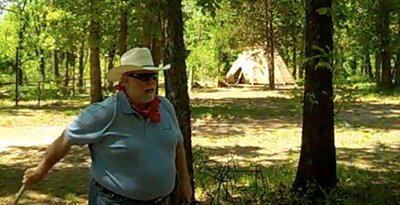 It’s pretty much a playground for men–tomahawk throwing, long bow shooting, horse riding, fishing, hunting. You name it, you can probably do it at Tom’s ranch.